Super Smash Brothers Brawl: Memory Edition is another example of the classic game Concentration. 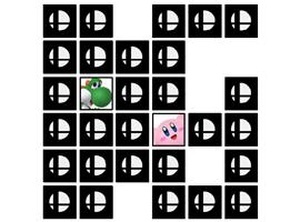 In this edition, watch where the various Nintendo characters are and select both of them to eliminate both of their cards. You win the game once all the cards are removed from the game. I needed to create this game for a Grade 12 Computer Science project. The end result we were meant to create I found was extremely lame, so I significantly improved on mine.